A Love Letter to..... - The Bear and Badger - a better class of conversation. A place to gush over a game, new or old. If you don't want spoilers then don't read the entry for that game because vast amounts of detail is something that I for one would appreciate. I personally don't have a problem with spoilers for older games and if a game gets a detailed recommendation that floats my boat then I'll happily play it and judge it for myself. I'd rather this than miss out on a game because I'd never considered playing it. The only criteria is you must have "finished" the main campaign if it's SP. If it's predominately MP, or MP only, you can judge it for yourself but presumably you've played it to bits because you're in love with it. The idea is not to just post because your brand new game seems like the best thing ever and you're shooting along in the hype train. Ideally, it's a game that you loved in the past and still revisit now, but if you've just finished RDR 2 and think it's the best thing then feel free to tell us all why, in detail. Multiple entries on the same game are fine - everyone has a different opinion on what makes a game good, but plz don't write a piece on why they're wrong. It's all about the love in here. I was blown away when Portal came out as part of The Orange Box. Almost as an aside to Half-Life Episode 2, this little 4hr puzzle game is a joy from start to finish and never outstays it's welcome. It was developed over 2 short years at Valve by a team of 5 people plus a shitload of testers. It excels in it's writing, originality, humour, gameplay and polish. It is, to my mind, one of the greatest games ever made. Portal started off as a student project called Narbacular Drop and they demoed it at the Digipen Student Games Showcase in 2005. They were asked to demo it again at Valve headquarters and Gabe Newell was so impressed he hired the team on the spot before the demo was over. It's such a simple gameplay mechanic, and the best thing about Portal is the way this is fleshed out over the course of 19 or so test chambers and 5 "escape" levels. This early teaser trailer tells you everything you need to know. One of the many great things about Portal is the start. You wake up in a small glass-walled room in what looks like some sort of hibernation/stasis chamber. There's a toilet and a radio playing tinny music, and there's a digital clock on the wall that's counting down from 1 minute. What's clear from the outset is something is going to happen soon, and it's probably startling/horrific enough that it needs a countdown in order for you to prepare yourself for it. Already it's created some tension, and also wonder. What is this place? It's also clear from the beginning this is some sort of jail or asylum. The status bed you wake up in is itself contained within a small glass cubicle, which is itself contained within a larger white walled room. There is no sign of a door anywhere. The glass cubicle is small enough that you can't really go anywhere or do anything, and as such you're instantly confined to do nothing but observe. Again, what is this place? 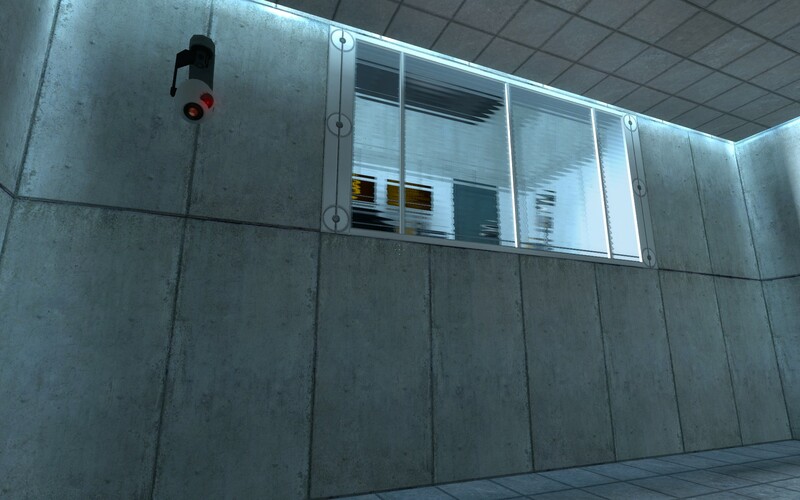 And with that the digital timer on the wall also reaches zero and a portal opens up in the wall of the cubicle. Through it you see a woman. Is it HER? She's wearing some kind of jumpsuit and is staring at something to the right. She's also in a glass room like yours. Can you go through the portal? You presume you can, and step through just as the women disappears to the right. You're in a room staring at a glass room contained within it, just like the one you've come from, and the woman has vanished. You look at the portal behind you and can still see the room you've come from. You go back through and you're in the cubicle again. You turn round to go back out and see the woman again. You tentatively walk towards the portal again and she tentatively walks towards the right again. You stop. So does she. You run through the portal and then it dawns on you. The glass room you're now looking at from the outside is the room you were just in and that woman is you, not HER. Your brain starts to do cartwheels. It remains the best opening of any game I've ever played, and similar on many levels to my next fave opening, Bioshock (also a 2007 release). Apparently, the team had nailed the puzzles and levels early on and the majority of the time was spent updating visual clues after heavy play-testing, and it really shows from the off. I love the place. There's no backstory whatsoever in this game - you have to wait until Portal 2 for that, and that somehow makes it all the more atmospheric. It has parallels with the film CUBE, and I'd be surprised if the film isn't an influence. Each puzzle is self-contained within a test chamber and beating each test involves getting to the exit, where a lift is waiting to take you to the next test chamber. It's all very clinical, with uniform shades of gray and white walls and all looks pleasingly ordered. There's a cleanness and simplicity to the visuals I really like. What I really love are the windows. They're always high up and they're clearly offices of some kind, and there's never anyone in them. Ever. At first it's merely a curiosity but as you play each level they somehow become more sinister. Where are all the people? The window height feels intimidating as they're always above, like an observation window, but there's never any people observing. And why is the glass obscure? You can't see in or out very well so what's the point of them? Are they there to merely intimidate? Surely nobody would put in a window that has no practical use except to intimidate? What use is that? WTF is this place? None of these questions are ever answered. The only thing that gives you any information is the nearly ever-present GLADOS, but SHE's only an automated voice, isn't she? Apart from that your sense of isolation is total, and you begin to wonder just how long you've been in stasis for and how automated this place actually is. What year is it anyway? Your only guide in this lonely place, and there's a good chance she's entirely automated. It seems to be so. She can be telling you a thing and as soon as you perform an action that completes a bit of the puzzle she cuts instantly and starts giving you info on the next step. She is funny, sarcastic and slightly threatening. That is, she seems threatening but that may be just your imagination. After all you are doing these tests against your own will, or at least with nothing else to do except progress to some kind of end, whereupon you will hopefully be released. Or will you? What is the point in these tests anyway? So much is left unanswered it's almost impossible to know how it will end, or what form the end will take. Death, escape or back to stasis? The writing is funny and dark and wonderful and it's all GLADOS. Like Gordon Freeman, you never speak a word. As you progress there are hints of someone else. You occasionally get access to small rooms "behind the scenes", areas that you weren't supposed to go. They can be well hidden and you have to look for them, and sometimes actually solve a puzzle to get to them. There are scribblings on the wall, tally marks - presumably of days, and manic drawings. One looks a bit like you, that woman you glimpsed through the first portal. And what's this about cake? You can find the backstory to this here. Of course, you find GLADOS isn't merely an automated voice later on and finally get to meet her. The threats weren't imagined after all. I won't say much about these except to say they're great. Flying through the air is thrilling and they are not so difficult that you'll ever be stuck for long but they are exquisite. And amazingly, they're better in Portal 2, but that's for another time. Wonderfully funny set-piece and the beginnings of the personality cores that make an appearance in Portal 2. Without doubt, the best credits and song to feature in a game ever. I'll cover the equally brilliant Portal 2 in another post but nothing comes close to the feeling of originality that the first game delivered. What a game. Copy/paste my post on Halo: CE from the just completed thread here, plox. Halo: CE Anniversary, solo, legendary, for the umpteenth time, but my first run in a while, and the first, I believe, through the entire anniversary version of the game (I bought it at release, but don’t think I ever played through it). The anniversary update is a triumph, it looks glorious, with some sections causing me to have to stop and just enjoy the artistry put into the textures that have been slapped on top of the architecture which itself remains unparalleled in its scale and design (special mention here to The Library which looks incredible). I also love the focus of CE in particular. The fact that it all happens on this weird alien world with occasional detours onto a couple of ships gives it a sense of coherence that I’m not sure that later Halos could ever live up to. Similarly from a narrative perspective, it’s all so self-contained with mystery, wonder and threat instead of later games’ embrace of alien politics, backstories and convoluted, galaxy-hopping stories. I was also going through and collecting achievements which isn’t something I normally do, but the achievements in the MCC have been nicely thought out and offer some additional challenges. Many involve completing levels under certain conditions (no jumping, no taking health damage, no switching weapons on Two Betrayals, kill every elite on Keyes etc) whereas many of the others are awarded for seeing Easter eggs or reaching skulls or terminals in tricky locations so they seemed worthwhile this time around. But the thing that really stuck with me throughout this is just how well put together the basic game is. I’ve banged on about the holy trinity of guns, grenades and melee in here before, not to mention the recharging shields for you and the elites and the risk/reward that engenders, but one other thing became clear here was that at one point or another in the game, every weapon available to me was the best tool for the job at hand and was the weapon I sought out. The last two or three levels saw me mostly going ham with a shotgun, perhaps using a pistol alongside it to push back elites until I was close enough to drop them with my shotty, or with a needler to sneakily thin out numbers, or a rocket launcher to explode those vents. Plus, I always love revisiting those great battles. Storming the beach on the Silent Cartographer, the Scorpion rampage on Assault on the Control Room, the entire Final Run section of Two Betrayals. Being given some tools plus a huge open area of enemies that need dealing with is great fun, and something which you saw less of in the later games, to their detriment. the way of dealing with The Flood being to kill all life in the galaxy. That plan is pure insanity. Please gush over an imagined piece I theoretically wrote about Thief 2. Or maybe Star Wars Arcade. Great read that, thanks. Really got me wanting to playing thief 2 again. Agreed, it was a solid write-up. However, it was a shame about the paragraph in the middle where you tried to argue that the flat-earth society “may be on to something” and somehow managed to link that into a rhapsody about McDonald’s food and Apple ear buds. It seemed out of place to say the least. Metroid Prime. But that's all I'm writing. You've got another divinity 2 post in you surely? That's MAG isn't it? Warhawk was up to 32 players iirc. I think I’ve posted this before, from one of my old blogs. "The Meikyokan dojo of the Narukagami Shinto school is really a secret society of assassins called 'Kage'. Everyone who knew that was sworn to secrecy, and not allowed to leave the compound. But one person broke the code of silence and escaped into the ruins of a deserted castle, in search of the only way out, through the castle tower..."
So begins if not the most enjoyable fighting game you'll ever play, certainly one of the most distinctive. When Bushido Blade arrived in 97/98, fighting games were dominated as they are today by time limits, health bars, and increasingly complex combo, super-combo, counter, counter-counter and super-counter-alpha-combo-plus systems. Bushido Blade took a different approach. Time limits, for a start, are thrown out. While character choice is not insignificant - the six characters spanning the typical speed/strength range we are familiar with - the differences are not as pronounced as in your typical fighting game. Instead, weapon choice is what really matters, as these largely dictate the different strikes available to the chosen character in game. The eight weapons (broadsword, katana, long sword, naginata, nodachi, rapier, saber and sledgehammer) not only have their own strikes, but they have their own heft and balance, their own strengths and weaknesses. The naganita allows greater reach than most weapons, but defence when your opponent gets inside your fighting arc is near impossible. The sledgehammer is slow and cumbersome, but devastating in the hands of a stronger combatant. The rapier does not have the same ability to slash as the other swords, while the katana might be considered the easiest to master, it is not the most deadly. Not only does each weapon have it's own high, mid and low strikes (mapped to face buttons) but these attacks vary, sometimes greatly, depending on whether your character is standing with a low, mid, or high centre of gravity (controlled by shoulder buttons). This combines with what developer Lightweight called their 'Motion Shift' system, where the momentum of a strike dictates what kind of strike can follow it. Strikes can be linked together in combos, but the player must time them with the character, resulting in a rhythm more akin to Tekken than Street Fighter. Combos rarely creep over three strikes, whether attempted or successful. Striking an opponents weapon will often knock them back and leave them open, but the aggressor's recovery is not guaranteed to be fast enough to take advantage of such a situation. Where a clash of swords is brought about by both swordsmen striking simultaneously there is a wrestle for dominance, the loser being knocked off balance to a position of disadvantage. Where Bushido Blade most obviously departed from the norm, however, is in the absence of health bars. Not just invisible health bars, but no health bar whatsoever. Rather, the game adopted a 'Body Damage System', where the result of a successful strike greatly depends on where it lands. A glancing blow to the body is not fatal, but slows the character down, slightly restricting movement. A successful hit on the legs cripples the opponent, bringing them to their knees. A strike to either arm both limits the strikes available, and completely prohibits holding the weapon with both hands, which renders heavier weapons near useless. A solid blow to the head or body is fatal. The conclusion most people reach is that this means that fights can end with one swift successful strike; they can and often do. What is less often remarked on is that this system can also mean prolonged fights culminating in two crippled combatants swinging wildly at each other like Rocky Balboa and Apollo Creed in the final round. To top all of this off, players are encouraged to embrace the way of bushido, and fight honourably, according to the code. No striking a defenceless opponent on the ground, and not utilising the abilities to throw a concealed dagger, or sand from the ground into your adversary's face. Such dishonourable conduct will only allow the player to progress so far, but not to completion, so while such tactics will be attempted in early games as players give in to curiosity, there is little point in utilising them when trying to see the games various endings. To encourage a more considered approach to the sword fights, the dialogue the book-ends each clash with dialogue which is typically melodramatic for a Japanese title, but also has a sombre tone. It depends on the character selected but, for the most part, the plot pits former friends and training partners against each other in battles to the death. There is no music during the fights, only the ambient noises of the desolate grounds of a ruined castle, the shuffling of the warriors' feet in snow-covered gravel, the clash of metal on metal, the clipped cry of a defeated swordsman. Bushido Blade has a decidedly melancholy atmosphere, which perfectly compliments its unusual gameplay. The legacy it left is a disappointing one. A direct sequel was released, but only in Japan and North America. The relationship between Lightweight and publisher Squaresoft, who had partly owned the smaller company, ended apparently prematurely, and the third title hinted at in Bushido Blade 2 never appeared. Genki then bought a significant share of the company, and in 2000 Kengo: Master of Bushido, a spiritual successor to Bushido Blade, was released for the PS2. It was not so well received, and neither were its two sequels. Lightweight and Genki parted company in 2006, six months prior to Genki's release of Kengo: Zero, the last game in the diminishing chain (Kengo Legend of the 9 outside Europe). Although its roots can be felt, Kengo: Zero is the leprous result of copying the copy of a copy. Bushido Blade's graphics haven't aged well, but it's gameplay has. In the book 1001 Video Games You Must Play Before You Die, Simon Parkin wrote that, "it remains the tensest fight to be had in video games." Desperately missing from PSN's PSone classics range - unsurprising given the bizarre nature of that catalogue - it is worth a visit to an online auction site, or trawl through any back stock your local retailer might have. Ignore any thoughts you have of trying out its more readily available successors. Find a copy of Bushido Blade, and you've got yourself a true gem. My 4 perfect games are Super Breakout, Asteroids Deluxe, Tetris and Super Monkey Ball. Expect posts on each of 'em. I'll probably cover the Parodius and DoDonPachi series too. Right, my Portal 1 lovefest is up in the placeholder. I have of course written mini reviews of my entire top 100 in the top 100 thread. If I get time I'll pick a few out and expand on them a bit. Do it. I have it but haven't really played it. I've a few I'd like to do I think. Dune II or Command and Conquer Red Alert, Civilisations 2, Half Life, UFO: Enemy Unknown. I'll have a think and post something soon.